Includes 2 bibs and 2 burpies. 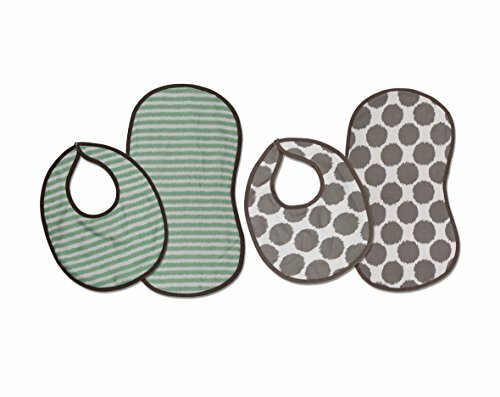 Set of two bibs: catch your baby's spills and dribbles with this set of three absorbent baby bibs. Our boutique quality 100 percent cotton muslin with cheerful designs gets softer with every wash. Pre-washed to maximize softness and we use premium cotton yarns to increase durability and minimize pilling. 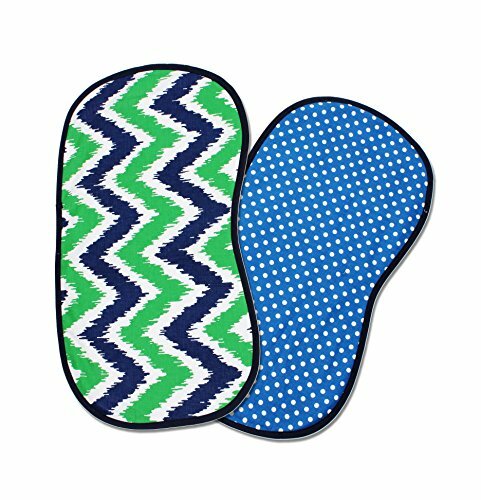 Machine washable, gets softer with every wash. Set of two reversible burpies:100 percent cotton premium muslin baby burpies are incredibly soft and absorbent. Reversible design with cheerful prints. 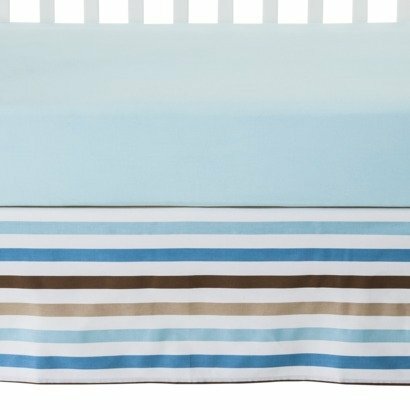 The super soft Bacati - Pin Stripes Crib/Baby Bumper Pad is made up of 100% cotton percale printed fabrics in classic pin stripes printed with dark grey ties to create wonderful bows. The Classic pin stripes make a statement and coordinates with many Bacati Bedding Collections makes any nursery cheerful and keeps your child looking at it for hours. Bumper Pad measures 2 pcs of 10" x 52", 2 pcs of 10 x 27". It coordinates with rest of Bacati Bedding Collections. See the entire rest of Bacati Bedding Collections for endless Mix N match possibilities. Machine Washable and gets softer with every wash. Cotton is a green fabric as it is renewable resource & biodegradable. Cotton is breathable making it more comfortable in extreme climates. Cotton is inherently soft delicate on skin of babies, durable & user friendly. Cottons gentle quality makes it appropriate for Babies with very sensitive skin or skin allergies. 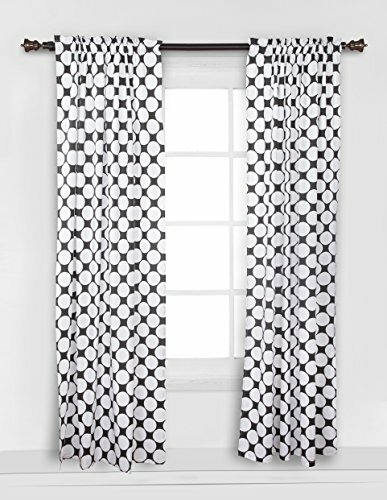 Bacati - Dots/Pin Stripes Grey Large Dots Curtain Panel is made from 100% cotton percale fabric. It has classic Dots print all over. Dimensions: 42 x 84" with 1" header and 3" rod pocket. It is wide enough to fit most of the windows. It is machine washable and gets softer with every wash. It coordinates with the rest of Bacati - Dots/Pin Stripes Grey/White/Yellow Bedding Collection. See the entire rest of Bacati - Dots/Pin Stripes Grey/White/Yellow Collection for endless Mix N match possibilities. Cotton is a green fabric as it is renewable resource & biodegradable. Cotton is breathable making it more comfortable in extreme climates. Cotton is inherently soft delicate on skin of babies, durable & user friendly. Cottons gentle quality makes it appropriate for Babies with very sensitive skin or skin allergies. 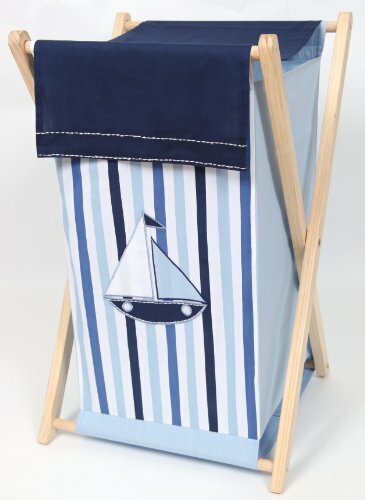 This HAMPER features in cordinating stripes and solid fabrics. A wood frame keeps baby's laundry organized and out of view. A removable mesh bag insert makes trips to the laundry room effortless. Coordinates with the Little Sailor bedding collection. 100% cotton. Machine washable. 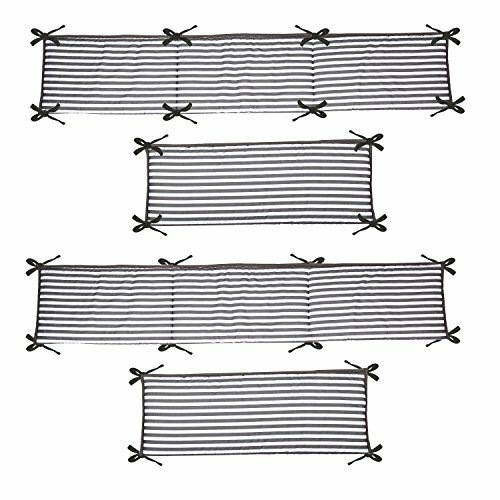 Dimensions 22"h x 14"w x 13"d.
Bacati - Dots/pin Stripes Black/white 10 Pc Crib Set Including Bumper Pad Includes BUMPER PAD, Comforter, Crib fitted sheet, Dust ruffle, Diaper Stacker, Valance, Mobile, and 3 piece Wall Hanging Set. Soft 100% cotton percale fabric with lofty polyester fill and machine washable. Cotton is a green fabric as it is renewable resource & biodegradable. Cotton is breathable making it more comfortable in extreme climates. Cotton is inherently soft delicate on skin of babies, durable & user friendly. Cottons gentle quality makes it appropriate for Babies with very sensitive skin or skin allergies. 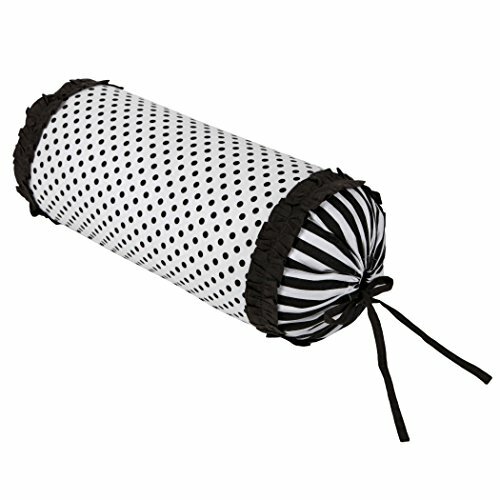 The super soft Bacati - Dots/pin Stripes Black/White Neck Roll is made with 100% cotton Black percale fabric and back with French ties. It has Black Dots Print on the front. It measures 7 x22 inches. Cover is machine washable and gets softer with every wash. Cotton percale shell with 100% Polyester lofty fills. It can be coordinated with rest of Bacati Dots/pin Stripes Black/White Bedding Collection. Cotton is a green fabric as it is renewable resource & biodegradable. Cotton is breathable making it more comfortable in extreme climates. Cotton is inherently soft delicate on skin of babies, durable & user friendly. Cottons gentle quality makes it appropriate for Babies with very sensitive skin or skin allergies. 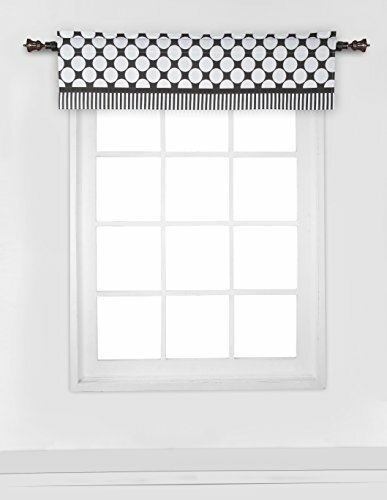 Bacati - Dots/pin Stripes Black/white Window Valance is made of black/white Dots & stripes print aS shown in the picture. Measures 54" wide with an 15" drop and 3" rod pockets. It is made from 100% cotton percale fabrics. It is machine washable and gets softer with every wash. It can be coordinated with rest of Bacati - Dots/pin Stripes Black/white Bedding Collection. See the entire rest of Bacati Dots/pin stripes Black/white Collection for endless Mix N match possibilities. Cotton is a green fabric as it is renewable resource & biodegradable. Cotton is breathable making it more comfortable in extreme climates. Cotton is inherently soft delicate on skin of babies, durable & user friendly. Cottons gentle quality makes it appropriate for Babies with very sensitive skin or skin allergies. Bacati Crib skirt is made from 100 percent cotton fabrics and lining and decking is 100 percent polyester. Measures 52" x 27" x 13" drop. Care: machine washable and gets softer with every wash. Cotton is a green fabric as it is renewable resource and biodegradable. Cotton is breathable making it more comfortable in extreme climates. Cotton is inherently soft delicate on skin of babies, durable and user friendly. Cotton's gentle quality makes it appropriate for babies with very sensitive skin or skin allergies. Copyright © Wholesalion.com 2019 - The Best Prices On Bacati Stripes Online.